Oh! what a lovely happy vase; so full of glorious colour. It is lovely when the remaining flowers put on such a good show. 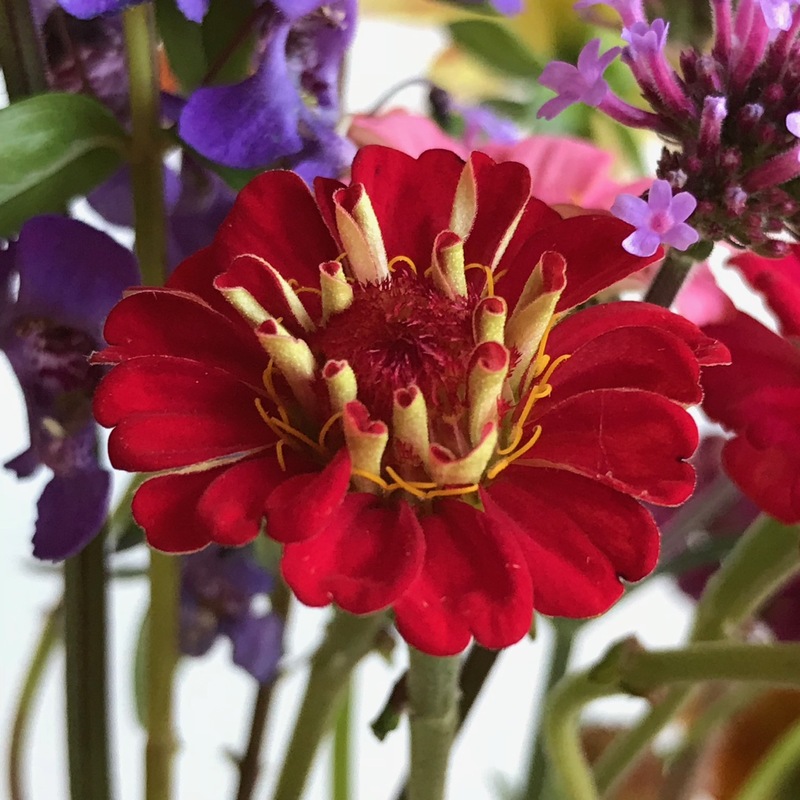 I have received so much pleasure from the zinnias this year. I didn’t plant cactus zinnias but even these little ones have been rewarding. The plants themselves look terrible now but they’re producing. Mine don’t look great anymore either and after the wind today I wonder if they will still be standing. 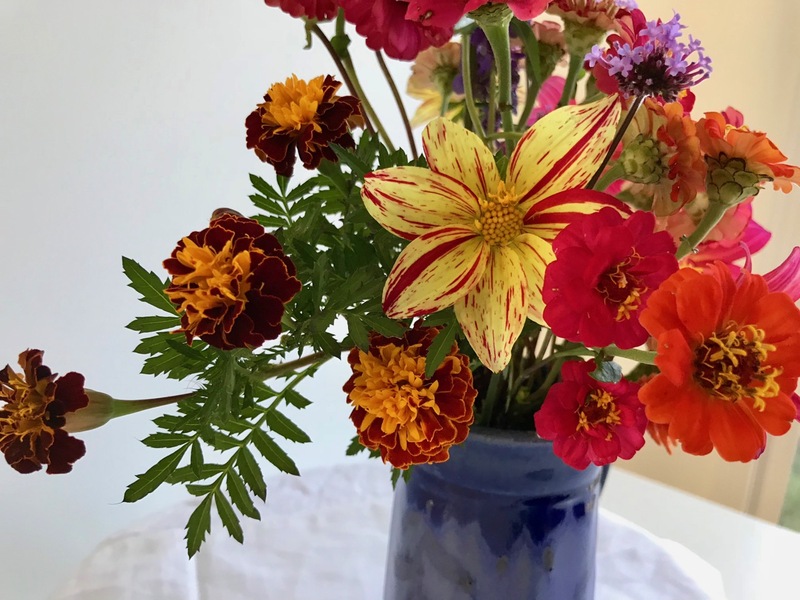 Lovely vase, and your Zinnias and Dahlias are gorgeous. Thanks Judy. I know colder weather is around the corner so am savoring these blooms. Thanks dear Annette. Summer seems a blur. This year I will try to embrace autumn and winter and enjoy that quiet beauty. Better than any fireworks, and your photography captures the wonderful details of the blooms. Happy IAVOM. Thanks Noelle. Don’t you love it when flowers decide to be photogenic and cooperative? This bunch loved posing (but were harder to arrange than usual). 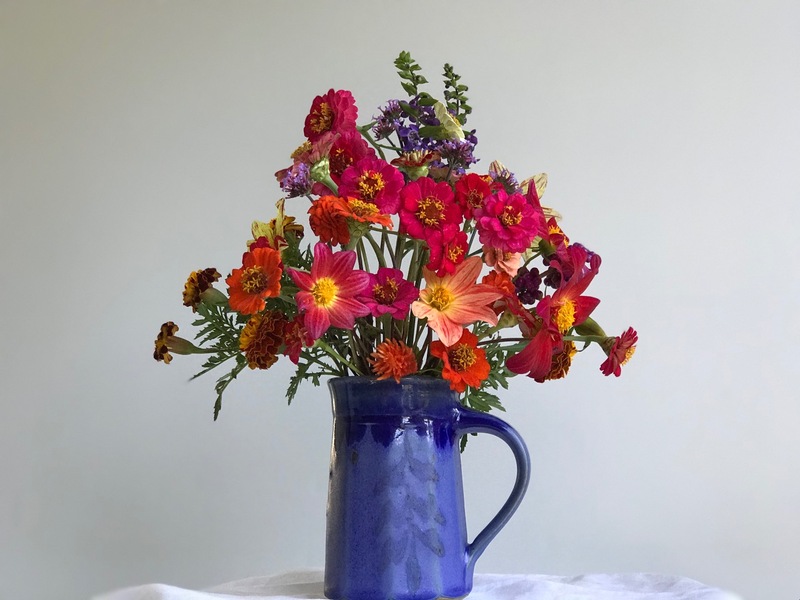 Lovely and cheery colors set off beautifully in the blue jug, a well-chosen contrast. Have a great week ahead, Susie! Glad you like them Eliza. I almost changed out that blue mug for something more subtle but it holds its own with these bright flowers. 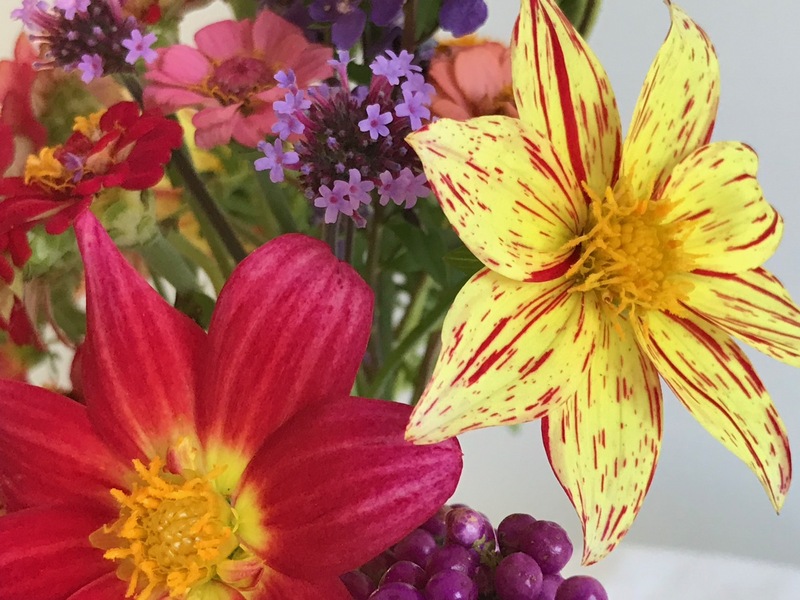 I love the cheerful bright colors in today’s arrangement. This could almost convince us that it’s still summer! Well done as always! Thanks Peter. Your IOVOM reminds me that autumn has plenty of color to offer! 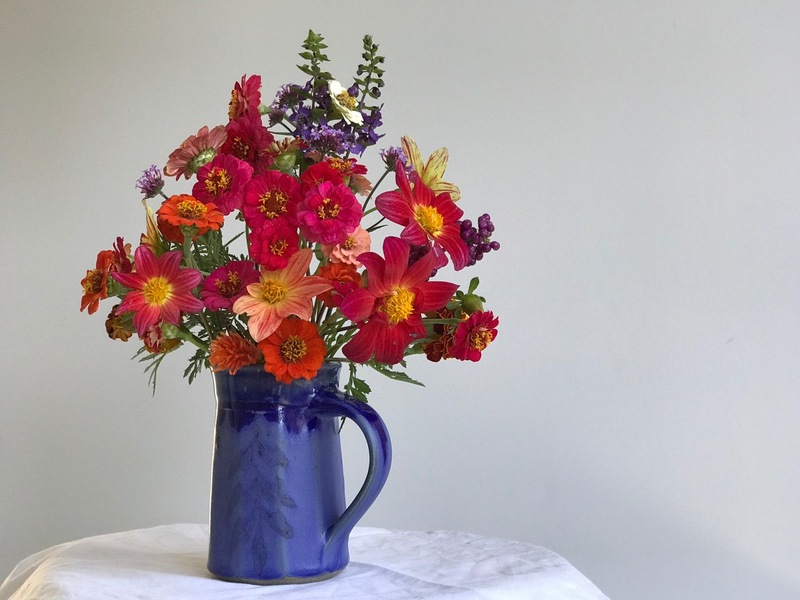 Susie it was a delight to see these flowers gone from my garden….that blue jug really makes the colors pop! Gorgeous…. Thanks Donna. Bought that mug from a potter at a local arts festival and have always enjoyed it. What lovely cheery colours. Great to have zinnias still going strong, mine have ground to a halt. Do you save seed? 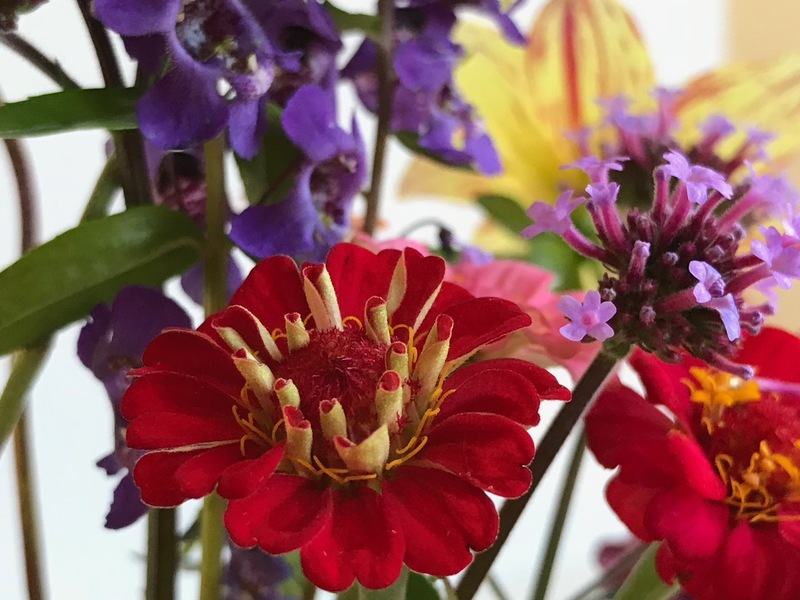 Yes, I do sometimes save zinnia seeds–they are pretty easy. 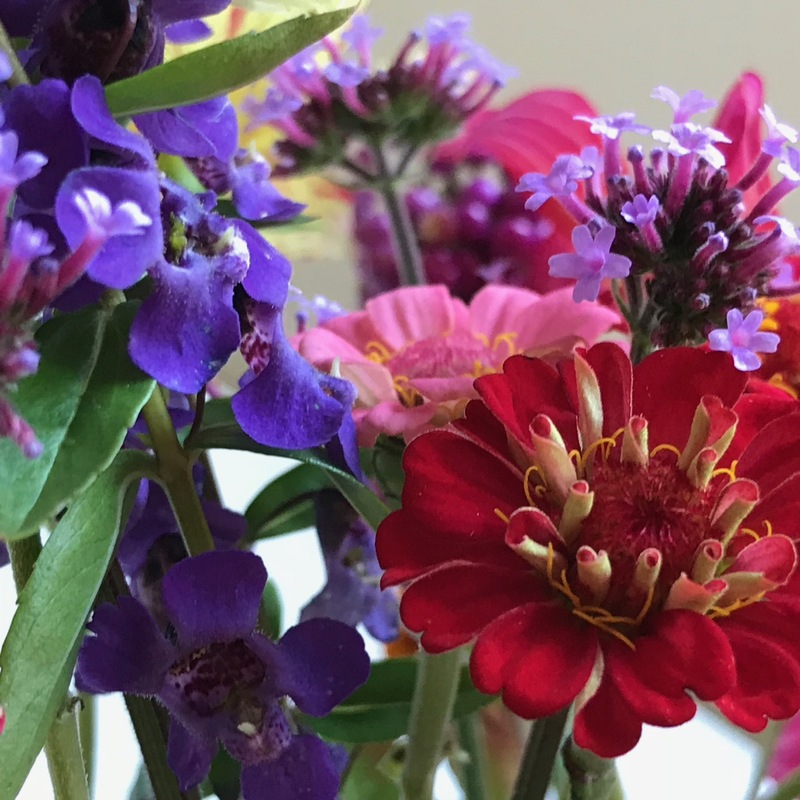 I sometimes save seeds from marigolds and zinnias as they’re very easy to grow, but none from anything else. I’m constantly amazed by what others grow from seed that I would not have patience for. This particular package was by Botanical Interests and was packaged for 2017! So yes, I do save seed! You still have some great colors from you garden. There are recipes to make jelly from the American Beauty berries, so they must taste good. Interesting! Have never heard of this jelly. The color itself makes me hesitate to taste! Well those colours are enough to blow your socks off – just fabulous!! Rich and sumptuous. I love them! My vase today is much more modest! I thought I would do an extra one, a lot more colourful, on Wednesday, for Halloween! 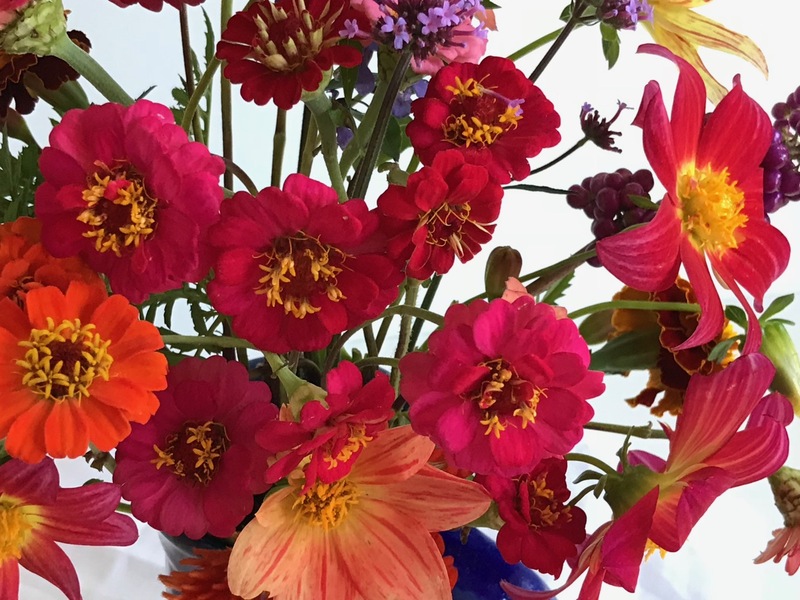 It was nice to be able to pull together all the zinnias for a vase today. Earlier in summer there were many more corals, oranges, yellows and even white from this mix. Pink and red are hanging on. Oh, there’s that beautyberry again. It is nice how all your flowers here are so compatible. Most of the dahlia do not play as well with zinnias as these do. Haven’t been very happy with this dahlia. Will look for fancier ones next year. How could you not be happy with those? They are so pretty with the other flowers. I happen to like dahlias (Perhaps it is the ‘ethnic’ thing. ), but some of the fancier types are rather garish. You created a pretty floral quilt from your remnants, Susie. 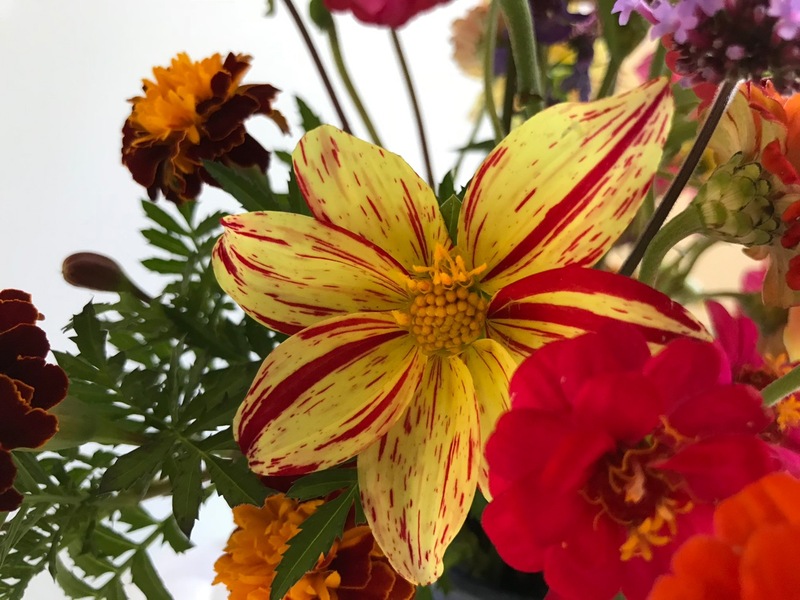 I had a yellow zinnia with red striping that I had mixed feelings about too but, with the right companions, your ‘Fireworks’ Dahlia is quite striking. Thanks Kris. Yellow and red together are not my favorite combination but the marking is nice. I will look for more interesting dahlias next year. 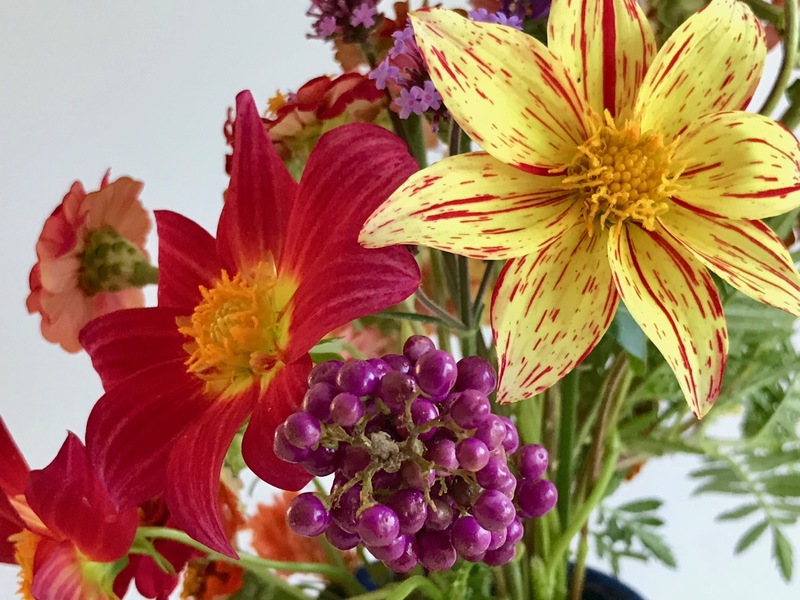 Autumnal yet cheerful, and that Dahlia ‘Fireworks’ is a winner! Jason, Fireworks just didn’t speak to me. I’ll try a fancier, larger one next year that hopefully will put on a bigger show. But grateful for any blooms this time of year. Oh, that’s so, so pretty! The bright red with the rich blue vase–magic! 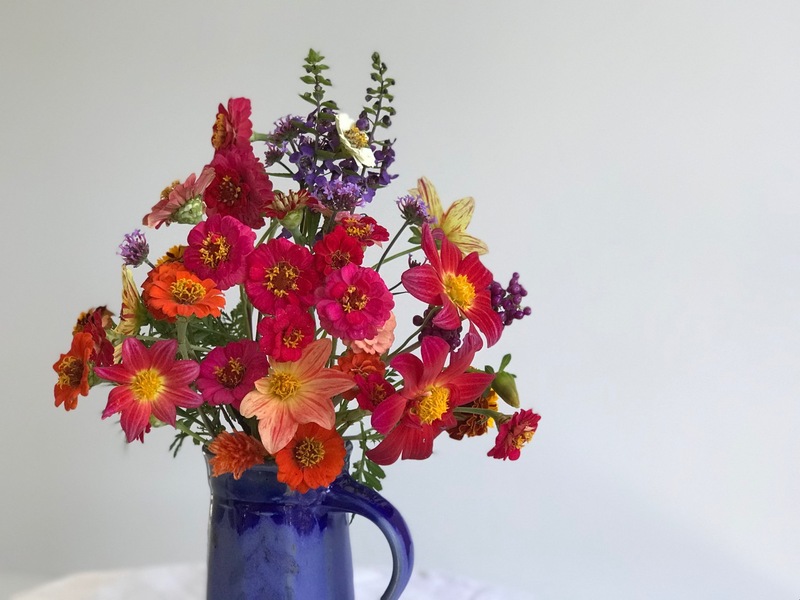 And of course, Zinnias and Dahlias are always favorites. Thanks Beth. The zinnias really are done for now so glad they went out with a bang. Thanks Cathy. The flowers were fresh but so very tiny–afraid to try to grow to full size this time of year I guess. Thanks! 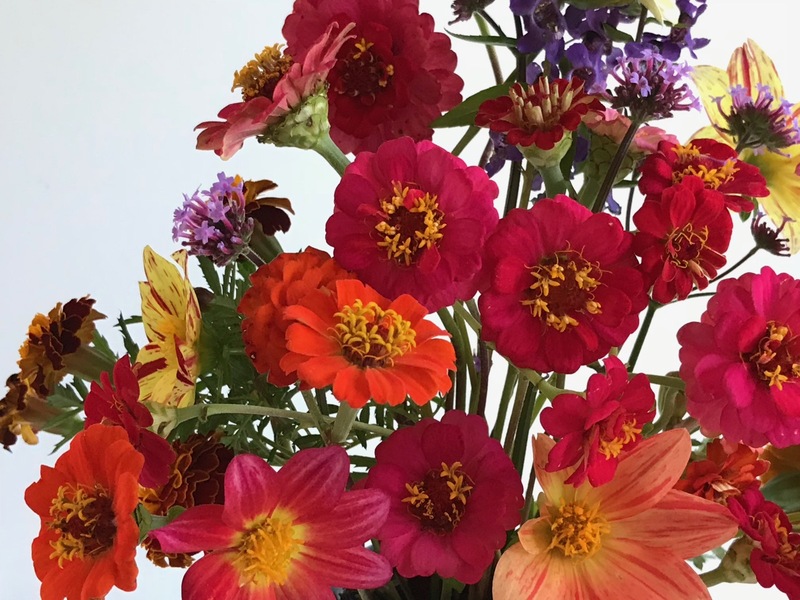 Would be great to be able to have zinnias in winter.